Healthcare workers donning chemical and medical safety gloves provides vital hand protection against risks that run the gamut from skin irritation to poisoning and even death. There’s also chemical burns, damage to internal organs and seizures; just in case you’re still in doubt about the importance of wearing the right chemical and medical gloves. Although the skin is the body’s main defence, it offers little protection against alcohols, solvents, chlorides, acids, bases and other chemical products. Many healthcare workers handle dangerous chemicals on a daily basis, with reusable instruments that come into direct contact with patients’ blood, tissue or saliva needing to be sterilised after each use. 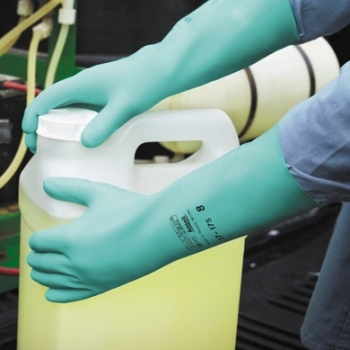 Choosing the right chemical and medical gloves for the right application is critical. The gloves should also provide dexterity and comfort where needed. Chemical protection medical gloves can be divided into two categories: Disposable and Re-usable. Designed to protect against incidental – splash or spill – rather than intentional contact. Should never be re-used or washed as this increases the likelihood of penetration. A nitrile glove is often the best protection against incidental contact, though latex and neoprene are also recommended. The choice of one material over another depends on the particular chemical used and the amount of contact. For direct contact with chemicals, such as hand immersion. 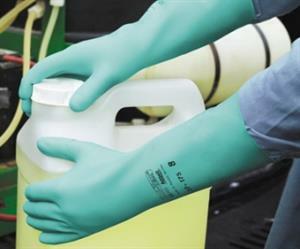 Better chemical protection than disposable gloves, but lose some dexterity and sensitivity. Two glove types: longer-lasting Standard glove for when flexibility and dexterity are important; Supported glove, with cotton lining, for more heavy-duty use. Your chemical protection glove choice depends on the durability required, the amount of contact with the chemical and if puncture resistance is needed.